Yet again Israel is bombing Gaza. This time too the number of dead Palestinians (till date) is as high as it was the last time in 2009 during the Operation Cast Lead. The reasons of the current attack is almost same if we are not bothered about the details, the Israeli ‘right to self defence’ (whatever that means). Yet again the world community namely the United Nations and leaders of the ‘big states’ are ‘worried’ about ‘the disproportionate use of violence’ by Israel. They all agree that Israel has the ‘existential threats’ and Hamas should not ‘attack’ Israel with its ‘rockets’. Meanwhile, surprisingly common people in all these countries and some of their leaders with their backbones intact have tried to stood up and argue differently. Demonstration after demonstration have been organised to show solidarity with the dying and suffering people of Gaza. Opposition of Gaza killings on humanitarian grounds is most welcome but can we or should we forget the history behind these killings and the real reasons of persistence of the problem for so long? All those world leaders who agree and support Israel’s right to self defence are doing so at the cost of Palestinian’s right to national self determination and their right to fight for it. The world leaders and Israel are standing together not to defend Israel per se but their imperialist dream to control the region in whatever way possible and at whatever cost. This article is an attempt to reiterate the history of the Palestine and to argue that Israel has no ‘right to defend’ as it is an occupier. Killing at Gaza is not only killing of humanity but it is yet another episode in the long drawn history of imperialism in the region. Palestinian struggle for self-determination and the Israel’s so called ‘existential threat’ are the two central points in the so called Israel-Palestine conflict. The world has seen the fall of old colonialism almost half a century ago. Nonetheless, the Israel-Palestine conflict is very much a part of the history of colonialism and imperialism. What was to be a war of liberation against the Ottoman occupation; the First World War turned out to be a precursor of yet another foreign rule in Palestine. British Mandate did not only replace Ottomans but also within 18 years facilitated the formation of a ‘Jewish Homeland’ as per its promises made to the British Zionists in the Balfour Declaration of 1917 (complete text of which can be accessed here, http://www.mideastweb.org/mebalfour.htm). The declaration is a classical example of imperialist arrogance as it promises the land of Palestine yet to be occupied from the Ottomans to a third party in exchange to the support in the war efforts. The Zionist movement, a reactionary movement against the anti-Semitic Europeans discriminating and persecuting Jews for various socio-economic and religious reasons, was formally started in 1892 by Theodor Herzl with a conception of a utopia of a ‘Jewish Homeland’ to be created in the biblical ‘Holy Land.” The problem, however, was to identify this ‘promised land’ on the face of the earth. The ancient history came as a help to Zionists to decide after a long period of uncertainty that the so called ‘promised land’ is Palestine. This started different gradual phases of Aliyah (migration) of European Jews to Palestine. The Zionist propaganda dipped with religious believes justified the migration on the basis of first, that Jews were once upon a time in the past (around 70 AD) expelled from this land and second, on the basis of a mythical slogan that “people without land (Jews) are going to a land without people (Palestine).” As we know this slogan is ridiculous and factually incorrect. Despite all the religious sloganeering and hullaballoo the migration of Jews to Palestine remained low till the beginning of the Second World War. In 1919 the Jews were less than 10 percent of the Palestinian population which increased to around 30 percent of the total population in 1939. The increased persecution of Jews under Fascist occupation in Europe at the time forced more and more of them to migrate out in the 1930s. Still, majority chose to go to the USA instead of Palestine. Nevertheless, amidst the occasional riots, the biggest being the 1936-39 uprising against the migrants, most of the Palestinians remained unaware of the promises of the Balfour declaration and some of them even welcomed the coming of the Jews for economic reasons. Meanwhile, Zionist established armed groups apparently to defend their positions in Palestine. These Zionist militias such as Irgun and Haganah used all kinds of terrorist acts to forcefully occupy land and throw the Palestinians out from their villages. Even the British authority criticised this massive use of violence by the Zionist gangs in the White Paper issued in 1939. In reaction to the riots of 1936-39 British authorities had to restrict the migrants’ right to own land in Palestine. It also tried to restrict the Jewish immigrant population in Palestine to one-third of the total population (see the White Paper issued by the British mandate authorities in 1939 here http://avalon.law.yale.edu/20th_century/brwh1939.asp). This restriction was lifted only after the horrors of holocaust became widely known and a sympathy wave was created in favour of Jews all over the world. After the Second World War when the population of Jews surged in proportion to the local population and the intents of the British authorities became obvious the Arab leaders reacted. 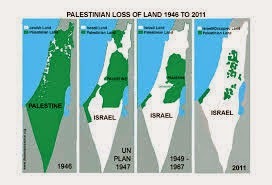 In order to save their skins British authorities took the case of Palestine to the newly formed United Nations (UN). After much deliberation UN passed a resolution 181 proposing partitioning of mandate of Palestine (see details here http://www.yale.edu/lawweb/avalon/un/res181.htm). The Arabs rejected the partition plan and revolted against the British. The unrest provided Britain to wash its hands and it withdrew its control over the Palestinian mandate territories. The uncertainty created by sudden British withdrawal from the Palestine played well for Zionist armed groups and using the opportunity on 14 April 1948 Ben Gurion and others proclaimed an Independent State of Israel on the land proposed by the UN partition plan. We should keep the fact in mind that despite a long history of immigration Zionist had failed to attract majority of the Jews to Palestine. When the state of Israel was created the Jews were in minority and only the fear tactics used by Zionist militias and the 1948 war which forced majority of local Palestinians to migrate and become refugees in the neighbouring countries (what is called the Nakbah in Arabic) created a Jewish majority in proper Palestine. This is a clear case of ‘ethnic cleansing’ forgotten by the world only because of the hegemony over media and other sources of information enjoyed by Israel and its strongest ally the USA. As expected, Arabs refused to recognise the new state of Israel and the first Arab-Israel war started. This war was used by the Zionist, as mentioned earlier, as an excuse to exclude and force more and more Palestinians out from their land. By the end of this war Israel had control over all the Palestinian mandate territory barring the West Bank and East Jerusalem (held by Jordan) and Gaza (held by Egypt). The Palestinians are suffering the brutal oppression and displacement from their land by the Zionist regime since 1948 onwards. The successive Arab-Israeli wars did not end the occupation. They rather prolonged it. The 1967 June War is a dividing line in the history of Arab-Israeli conflict. At the end of the war remaining territories in the Arab hands (West Bank, East Jerusalem and Gaza) too were occupied by the Israel along with Golan Heights from Syria and Sinai Peninsula from Egypt. The loss of lands to Israel in the 1967 war made Arabs rulers, particularly Abdul Gamel Nasser of Egypt realise that they cannot defeat the Zionist state till it has the support of the US and European countries. The 1973 war (initiated by Egypt and Syria) was an attempt to bargain with the Israeli state and get their lands back. The exchange of the lands post 1973 war and signing of 1979 Camp David accords won first Arab recognition for Israel. Palestinians were left alone to fight for themselves hereafter. Though Palestinians could not end the occupation, their struggle under the leadership of Palestinian Liberation Organisation (PLO) was able to keep the issue alive. The Palestinian movement was able to mobilise support of the people forcing the world powers to do something to resolve the issue. According the UN partition plan, 23 percent of the historic Palestine was allotted to future Palestinian state. In the 1948 war mostly those parts remained in the Arab control which was assigned to Palestinians by the UN. In 1967, all these remaining lands also went under Israeli control. For next 36 years, these territories saw the establishment of numerous Jewish settlements under the Israeli policy of ‘creating facts on the ground’ in order to repudiate any future claim by Palestinians on these lands (Said 1992). After the June war of 1967 UNSC adopted resolution 242, in which it asked Israel to vacate the territories it has occupied during the war. It also recognised the right of the existence of all the states in the region. UNSC resolution 338 accepts the right of Palestinian refuges to return to their homes. With the acceptance of all these three resolutions PLO and Israel started negotiations in 1990s for the establishment of an independent Palestinian state leading to the signing of the Oslo accords in 1993. Once the end of the Cold War became inevitable and supremacy of the USA was established in the global politics the Palestinian National Congress, Palestinian parliament in exile, an organ of the PLO, in 1988 recognised the state of Israel in the hope of a peaceful settlement of the dispute and in a way accepted the UN partition plan. Hereafter the PLO pitched for a two state solution as a fait accompli. PLO’s acceptance of United Nations Security Council Resolutions 242 and 338 did not bring Israel to end its occupation forcing Palestinians in the occupied territories to start a peaceful but strong resistance commonly known as the first Intifada (1987-1990). These developments finally forced the world community to intervene. The ‘mediating’ efforts of US and other major powers led to the signing of the Oslo Accords in 1993 by PLO and Israel. The US mediation was not a benevolent act. It was an attempt to bully and make PLO accept the humiliating terms of the Oslo. US could think of this as the world situation was in its favour after the weakening of the Soviet Union. Despite drawbacks and advantages to Israel, Oslo brought the hope for a peaceful solution to the Israel-Palestine conflict. However, PLO’s surrender at Oslo as termed by Edward Said was opposed by a substantial section in Palestine. The Declaration of Principles signed in the Oslo peace process, identified four core issues; borders of the future Palestinian state, the status of Palestinian refugees, the status of Jerusalem and the settlements inside the West Bank and Gaza to be solved in final stages. These are the issues on which neither of the parties was willing to compromise. The Oslo accords created the Palestinian Authority (PA) an interim elected body of Palestinians to govern the territories identified to be transferred to future Palestinian state once created. As Edward Said argues PA became a municipal authority which has all the dirty work to do without much authority. Israel still controlled the borders and all the settlements created deep within the occupied territories violating every international convention and law. Oslo accords were never fully materialised for several reasons. One of these several reasons was the unwillingness of the Israeli state to transfer the essential resources to the PA so that it can have control over the assigned territories. The assassination of Yitzhak Rabin, the prime minister of Israel under whom Oslo accords were signed, in 1996 and formation of rightwing government intensified distrust against the accords among the Palestinians. The idea behind the acceptance of Declaration of Principles and subsequent Oslo accords was the gradual establishment of normalcy in the region and mutual coexistence of both the people. However, by the time the agreements were signed there were strong sections in Israel and among Palestinians who did not share the belief in the principle of ‘land for peace’ adopted by both the parties as the basis of talks. In Israel, right wing parties like Likud had been reluctant to accept the ‘two state solution’. For them Jordan is Palestine and Palestinians have no right on West Bank, East Jerusalem and Gaza. * In the Palestinian side, intellectuals like Edward Said opposed the Oslo accords as a compromise of the Palestinian cause on the grounds that the PLO conceded too much ground and got nothing concrete in response from Israeli side (Said 2001). Meanwhile, the resource crunched PA failed to improve the conditions of the Palestinians mostly because Israel’s reluctance to transfer important subjects and revenues to it as agreed in the agreements signed during the peace process. Israel transferred only its legworks to PLO in occupied territories without giving it any authority. Israel also restricted movement of Palestinians depriving them from sources of employment. The result was the spread of widespread poverty and unemployment. Within less than ten years period starting from 1994, the percentage of Palestinians earning less than $2 a day in the West Bank and Gaza rose from 20 to 60 (Hilal 2006: 15). The decline in the living standards and increase in unemployment among the youth in Palestine made them attracted to the calls of radicalism. We should keep this in mind that fight against occupation and imperialism cannot always be united. The might of occupiers and length of struggle might create demoralisation among one set of leadership and can also create a sense of defeatism leading to compromise. In this situation a new set of or sets of leadership emerges which keeps the militancy of the struggle alive. According to Frantz Fanon for a colonized and subjugated people “to break the mental shackles of despair, quiescence, or humiliation only [way possible is] through armed struggle or active self assertion” (as quoted in Sayigh 1997: 26). Hamas was not the first such entrant in the Palestinian movement. There were Popular Front for the Liberation of Palestine [PFLP], PFLP-General Command, Democratic Front for the Liberation of Palestine [DFLP] and others in the previous decades too. These organisations used “terrorist” methods and Israeli civilians and military men were targeted both inside and outside of Israel irrespective of the brutality of the Israel retaliation. No matter how much violent the opposition to occupation was it was never the only and central method of resistance before the second Intifada starting from the year 2000 when Ariel Sharon, then the Prime Minister of Israel entered Haram al Sharif just to provoke the Palestinians on 28 September. Hamas is an acronym of the Arabic Harakat al Mokawama al Islamiya (Islamic Resistance Movement) which also means zeal. It was founded in December 1987 in Gaza in order to give the ongoing Intifada a leadership. An outright opponent of the idea of a Jewish state on the Palestinian land Hamas has religious nature unlike PLO which was considered to be a secular movement. Hamas believes that Palestine is a Pan Arab issue again unlike PLO, which is more committed to distinct Palestinian nationalism. Leaders like Sheikh Yassin and Ismail abu Shanab were members of Muslim Brotherhood before they founded the Hamas. Some sources talk about the possible role of Israel in creating the Hamas as a counter to PLO. Hamas has a web of charity, armed and political wings in the Gaza and the West Bank through which it operates. Its actual strength lies in its “political standing, social and charitable services, religious activities, educational facilities and so on” through which it intervenes in the daily life of Palestinians (Hroub 2004: 22-23). The rise of Hamas in the Palestinian politics in the last three decades is more a result of its tactic-oriented approach to the conflict. The major reason of its current popularity has been the failures of Israel to understand the gravity of the resentment among the Palestinians to its backtracking on the commitments to PLO during the Oslo peace process. Failures of PLO to establish an independent Palestinian state as it was expected in the aftermath of Oslo, forced people to look for an alternative. Hamas was waiting for the moment (Hilal 2006). The support base of Hamas in Palestine rose from around 30 percent in 1999 to around 50 percent in 2006. While prior to second Intifada in 2000 its main support base were youth in the refugee camps in the Gaza. During and after the second Intifada Hamas has gained support in all the major sections of the Palestinians population (Hilal 2006). The victory in 2006 Palestinian elections has proved the declining popularity of PLO particularly after the death of Yassir Arafat. Still Hamas is more popular in Gaza than in the West Bank. The 2007 clashes between it and Fatah had proved it very clearly. These clashes have virtually divided Palestinians along the party and territorial lines. The responsibility for the rise of Hamas in the Palestinian politics also lies in the fact that Israeli establishments is reluctant to respect even meagre relief and hope provided to the Palestinians in Oslo Accord. Every subsequent change in the governments in Israel often has strengthened the policy of non-cooperation with the PA using the excuse of non-deliverance on the provisions in the Oslo Accords. For example, between 1994 and 2000 the number of Israeli settlers residing in the West Bank and Gaza rose by 70 percent despite the commitment to stop the further settlement given by the Israeli government in the DOP. The implementation non-cooperation policy with PLO has not only increased number of settlers in the Occupied Territories but it is responsible for the derailment of Peace Process altogether. Ariel Sharon, the man accused of 1982 massacre of more than 3000 innocent Palestinians in Sabra-Shatila camp in Lebanon, after becoming the Prime Minister of Israel in 2001 took the opportunity provided by the second Intifada to erect a ‘separation wall’ dividing the Arab and Jewish population within the Occupied Territories, creating a web of security checks and barriers and restricting entry of Palestinians in certain parts of their own territories. These steps were supposedly an attempt to check the violent activities of Hamas and Islamic Jihad but they created more trouble and hardships for the common Palestinians. It divided Occupied Territories in small pieces making the future Palestinian state almost look like Apartheid South African Bantustans. The helplessness of PA to counter these steps made people disillusioned from its leadership. At the same time Israeli withdrawal of all settlements from Gaza in 2005 even for security reasons, gave more credibility to Hamas. It also gave it an open field to operate. Despite the fact that Palestine is a clear case of imperial occupation the complexity of the issue lies in the fact that Zionist oppressors themselves had been the victim of world’s worst oppression under the Nazi and Fascist rules between the two world wars. Edward Said recognises the history of anti-Semitism as the most peculiar aspect of Israel-Palestine conflict (1992). After the Holocaust Jewish determination of ‘never again’ to let the community face the same plight, made the rightwing Zionist among them popular. Subsequent wars with the Arabs and terrorist attacks against Jewish population created a substantial section of paranoids who could believe in the myth of ‘existential threat’ coming from Arab demands of justice (Kimmerling and Migdal 2003). The charters of PLO first and Hamas later and rhetorical speeches made by some of the Arab leaders have been cited by Zionist propaganda machinery added by US’ as examples of Arab resolve to throw the Israeli state ‘into the sea’ squeezing any space for sensible argument. The sympathy created by such intelligent use of rhetoric has strengthened Israeli occupation and in certain regions even popular (one survey in the wake of current Gaza attacks says that even today more than 60 percent youth in US support Israel’s right to defend) and has given it the diplomatic power to resist any move to create a Palestinian state which is a precondition of peace in the region. This propaganda and the shameless support (both military and political) provided by USA and other European powers such as France have been the biggest support of the Israeli rigidity and perpetuation of the occupation. The dominance over the sources of popular information has helped the imperialist powers to create what Chomsky says a “manufactured consent” in favour of this illegal and immoral occupation. It may be the success of this propaganda that instead of talking about Palestinian right to self determination and getting angry at the existence of longest surviving settler colonialism, ‘worries’ of ‘world leaders’ are restricted to death of innocent children etc in Gaza. People should be able to see through the hypocrisy. *This is the so-called ‘Jordanian option’ for the solution of the Palestine-Israel conflict presented by the Israeli right and for a time was even acceptable to Labour party. See Rolef, Susan Hattis (1997), “Israel’s Policy toward the PLO: From Rejection to Recognition”, In Sela, Avraham and Moshe Ma’oz (eds), The PLO and Israel: From Armed Conflict to Political solution, London: Macmillan. Hilal, Jamil (2006), “Hamas’s Rise as Charted in the Polls”, Journal of Palestine Studies, 32 (3): 6-19. Hroub, Khaled (2004), “Hamas after Shaykh Yassin and Rantisi”, Journal of Palestine Studies, 33 (4): 21-38. Kimmerling, Baruch and Joel S. Migdal (2003), The Palestinian People: A History, Cambridge: Harvard University Press. Said, Edward (1992), The Question of Palestine,New York: Vintage Books. ____________(2001), The End of the Peace Process: Oslo and After, New York: Vintage Books. Sayigh, Yezid (1997), “The Armed Struggle and Palestinian Nationalism” in Sela, Avraham and Moshe Ma’oz (eds), The PLO and Israel: From Armed Conflict to Political Solution, 1964-1994, London: Macmillan, PP-23-35. The author is Assistant Professor at Gargi College, Delhi University.